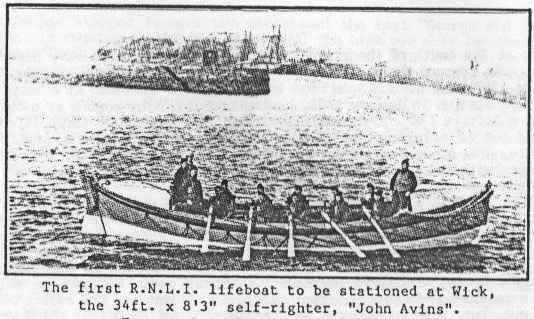 The new Wick Lifeboat, John Avins, was launched for the first time on service, at 5.00pm on 26 February 1896. For some days, a south-westerly gale had been blowing, keeping all the fishing boats in harbour. However early that afternoon, the gale blew itself out and the local fishing lugger, Brothers, put to sea, followed by the Isabella. A very heavy sea was still running and the Isabella soon got into difficulties. Her crew dropped anchor and the Pilot Boat put out to her assistance. But, as she cleared the harbour mouth, the Pilot Boat was swamped and her crew were thrown into the water, fortunately managing to get ashore safely. By that time the Isabella had been driven ashore, three of her crew being able to scramble onto the rocks as heavy seas washed over them. Meanwhile, the lifeboat had been launched and Coxswain McKay dropped anchor and veered the lifeboat down towards the stranded boat. Great difficulty was experienced in getting alongside the lugger, because of the huge waves and the close proximity of the rocks. However, with great skill this was done and the remaining six fishermen were rescued.